I Can’t Stand Up From the Toilet! One remedy to help make it easier to transition on and off the toilet is to add toilet rails. Toilet rails are rails that are installed on or around the toilet to provide added support when sitting down on or standing up from the toilet or when transferring from a wheelchair to and from the toilet. 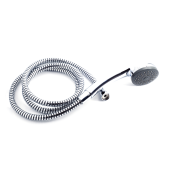 They are available in an a multitude of types and styles to fit a variety of different needs. 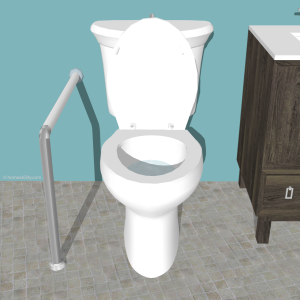 One of the key differences in toilet rail types lies in where they are designed to be attached, which can include: the toilet, wall, or floor, or alternatively they may be included as part of a portable frame that rests around the toilet. We have provided a quick overview of the different types of toilet rails below to aid you in identifying which type will best work for your home and needs. Some toilet rails are designed to rest fully on top of your toilet bowl. This type is usually easy to install. It typically entails removing the two screws that hold your toilet seat in place, positioning the toilet rail bracket over the holes located at the back end of the toilet bowl and reinserting the screws. Models may have one or two horizontal support rails that extend across the bowl to help stabilize the rails. Models with two horizontal rails will usually be more stable. Models with only one horizontal support rail that rests at the back of the bowl and two separate pieces that rest on the front side of the bowl may become dislodged if someone pushes both up and outwards as they are coming up to standing. Persons with bariatric needs usually benefit from models with legs that extend down to the floor for additional support and stability (see next option). Toilet rails with legs that extend down to the floor provide an added degree of stability because the weight is transferred down to the floor, which means they do not rely solely on the toilet seat’s bolts for stability. Installation typically entails removing the two screws that hold your toilet seat in place, positioning the toilet rail bracket over the holes located at the back end of the toilet bowl and reinserting the screws. Models differ in where the toilet rail’s legs touch the floor. The legs on some models extend down and meet the floor about midway along the length of the toilet bowl, meanwhile on others they will extend down and rest on the floor slightly in front of the toilet bowl. If you use a walker or wheelchair and your bathroom is small, we recommend to try to avoid the models with legs that extend past the front of the bowl, because the toilet rail’s legs could interfere with your ability to move and turn around inside the bathroom using your walker or wheelchair. Yet another option for adding handles around the toilet is to install a toilet seat riser that comes equipped with handles. The riser part enhances the seat height, making it easier to stand up from the toilet and the handles provide added leverage for use to push up to standing. Toilet seat risers are available in different heights, which typically range somewhere between 2 to 4 inches in height. Toilet seat risers come in a variety of different kinds. Some models are designed to be installed underneath your existing toilet seat, while others are designed to be used as the toilet seat itself. There are different shapes to suit different toilet bowl sizes (round or elongated). Some models are designed to be attached to the bolts at the back of the toilet seat, while others are designed to be held in place via a clamping mechanism that attaches it to the toilet bowl. Ones that are fixed to the toilet bolts will typically be safer than ones that clamp to the toilet bowl because the ones that clamp to the bowl can loosen with time and need to be periodically retightened to ensure a tight hold. Toilet rail frames can be purchased to rest around the toilet, which do not require any installation at all (aka stand alone toilet rails). Some toilet rail frames can be easily folded up, making it possible to hide it away when guests are coming or to take along when traveling. Of note, these types of toilet rails often extend beyond the front edge of the toilet. If your bathroom is small it can interfere with your ability to maneuver or turn around inside of a small bathroom using a walker or wheelchair. Since this type is not formally attached to anything, there is a greater chance it may tip or wiggle a bit as you are rising, than some of the other toilet rail models that are fixed to the toilet, wall, or floor. 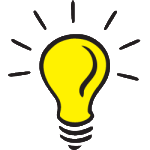 Another alternative is to add an elevated toilet seat or commode (aka portable toilet or toilet frame) over the top of your toilet. This option not only provides handles to use for assist with standing up, but also allows you to increase the height of the toilet seat, making it easier to stand up. Most commodes have an adjustable height seat that can achieve, on average, a seat height range somewhere between 18″-23″ high. Most toilet frame models will include a hard-plastic liner (bucket without a bottom), which helps to ensure all contents go directly into the toilet and won’t splash out the sides, since the seat will rest higher above your existing toilet bowl. Some are equipped with drop away arm rests allowing a wheelchair user to slide from the wheelchair’s seat directly to the commode seat. Some models have a padded seat, which can be helpful for persons with pressure-sensitive skin. Foldable models exist too, making it possible to take the toilet frame along when you are traveling or to easily hide it away when guests are visiting. Flip-up style grab bars (aka flip down grab bar and pivoting grab bars) have a hinge, allowing them to be flipped up out of the way when not in use and flipped down when they are needed. When there isn’t a side wall close enough to the toilet to mount a typical grab bar, this type of toilet rail provides a great alternative. One or two flip-up style grab bars are often installed on either side of the toilet to be used for support when sitting down and standing up from the toilet. It is also helpful for wheelchair users who rely on a lateral sliding transfer to move from their wheelchair to the toilet. The grab bar can be moved up out of the way for the transfer and pulled down to use for stability when leaning to perform toilet hygiene or managing clothes. Some models are designed to be attached directly to the wall and others have a base that attaches to the floor instead. A few of the wall-mounted models are equipped with a support leg that extends down to the floor to provide additional stability and some models include a toilet paper holder too. Wall mounted swing out style grab bars (aka Hinged Grab Bar, Swing Away Grab Bar, Pivoting Grab Bar) are a versatile support rail, providing a multitude of handholds at different heights. Most models include stationary horizontal and vertical grab bars, as well as a curved bar that can be swung sideways and locked at various angles. When not in use, it can be folded flat against the wall. Pivoting grab bars can be installed on the wall opposite the toilet to provide assistance when lowering down onto the toilet and pulling oneself back up again. Alternatively, if there is a wall present next to the toilet, it can be installed on the sidewall, ahead of the toilet bowl. Floor to Ceiling Poles (aka Security Pole, Transfer Pole, Safety Pole, Standing Pole) can be positioned beside the toilet to provide a helpful handhold when sitting down on or standing up from the toilet. This type of toilet safety rail does not require screws, nails or fasteners. It is held in place by tension, which is applied by turning a jackscrew mechanism until the pole extends to a length that is sufficient enough to become firmly fixed it in place between the floor and ceiling. Most models are equipped with pads at either end, which prevent the pole from marring the floor or ceiling. Safety pole models will vary in their maximum achievable heights and weight limits. Some models can accomodate ceiling heights up to 140″ high and some bariatric models can accomodate weights of up to 450 lbs. Models can be found in either white or black. As the name implies, this type of grab bar attaches to both the wall and the floor. It is an L-shaped rail that extends outwards from the wall and bends 90 degrees to meet the floor below. L-shaped rails can be installed on just one side of the toilet or on both sides of the toilet. Models equipped with a second small support leg that extends down to meet the floor (like a kickstand) will usually be more stable than models that do not provide this feature. Of note, these rails have a fixed height, so it is good to confirm the height of the rail is appropriate for your needs, prior to ordering. If you have a small bathroom and the rail will extend beyond the end of your toilet bowl, be aware it could make it more difficult for you to move and turn around in the bathroom if you use a walker or wheelchair. Grab bar toilet paper holders dual as both a toilet rail and a toilet paper holder, uniting both of these concepts neatly together in one. Multi-purpose grab bars make it possible to smartly and stylishly integrate a toilet rail into an existing space. If you have difficulty with sensation or strength in your hands, make sure to take into consideration how the toilet paper is loaded and unloaded from the holder, when selecting a grab bar toilet paper holder. These types of grab bar are L-shaped and designed to be fixed to one wall. 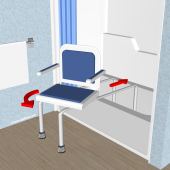 They can be installed on the wall across from a toilet or on the wall beside the toilet, providing both vertical and horizontal handholds to assist a person with sitting down and standing up from the toilet. Angled grab bars (aka Vertical Angle Grab Bars, 135 Degree Angled Grab Bar, Wedge Grab Bars, & Boomerang Grab Bars) have a horizontal bar and a second bar that extends upwards at an angle, providing users with a variety of different handholds. This type of grab bar is often located on the wall beside the toilet, providing a user with a horizontal bar to push up from or the vertical part to pull on to assist with rising from the toilet. Mechanical toilet seat lifts come equipped with handles, providing a place to hold onto when sitting down and standing up. Some have springs or a pneumatic lifting mechanism that provides some added support as you begin to stand up. Others rely on batteries or electricity and will fully assist you in moving from a seated to a standing position. Models will vary in the maximum seat height they can achieve. Some models can raise the toilet seat up to 26″ tall. A few toilet seat lift models include wheels, which are helpful if you are someone who has trouble walking to the bathroom. The wheels will make it possible for a caregiver to push you into the bathroom seated on the chair and then position the chair over the top of the toilet. The standing mechanism then helps to make it easier for you to stand up for performing hygiene and for standing to pull pants down or up. Shape of Toilet Bowl: If you plan to install toilet rails that are fixed to a toilet seat riser, confirm the shape of the toilet seat riser model you select will fit the shape of your toilet bowl (round or elongated). Width of Rails: Confirm that the space present between the toilet rails of the model you select will accomodate the width of your hips. Height of Rails: Confirm the toilet rail height is appropriate for your needs. Some toilet rail models come in fixed heights and some have adjustable height handles which can vary in their minimum and maximum achievable heights. Weight Capacity: Confirm the toilet rail model selected will accomodate the weight limit you require. No Return Policy! Once you purchase it you own it! Due to FDA regulations toilet equipment, such as toilet seats and risers, cannot be returned unless it is still sealed in the original packaging, so it is important to make sure the height, weight capacity, and features are appropriate for your needs prior to purchasing. The addition of toilet rails are a simple, effective means to make it easier and safer to lower yourself down to the toilet and to push yourself back up again. We recommend to first identify what type of toilet rails will work best for your needs and bathroom, then hunt for a model with the best reviews. We have provided some general tips below to further aid you in selecting a type best suited for your needs and the allotted space. 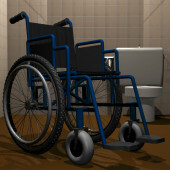 Tiny, Cramped Bathroom: Do you use a walker or wheelchair and have a small, cramped bathroom? If so, try to avoid selecting toilet rails that would extend beyond the front of your toilet bowl because they may interfere with your ability to move and turn around inside the bathroom. Wheelchair User Lateral Transfer: Do you use a wheelchair and perform transfers by sliding sideways between the wheelchair seat and toilet? If so, the wall-mounted flip-up style rails and the freestanding commode models with swing away arms (aka drop arm commodes) are both good considerations because you can swing the rail up out of the way to perform the transfer. Then once you are safely seated on the toilet, you can swing the rail back down to use for balance while seated on the toilet and for stability when pulling your pants down and up. Renters: The free-standing toilet frames, commodes, floor-to-ceiling safety poles, and models that attach to the toilet itself do not require formal installation, making them good considerations for persons who are renters. If you wish to add a rail that gets fixed to the wall or floor, consult with your landlord first. 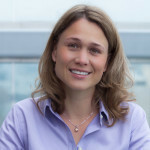 According to the Americans with Disabilities Act, landlords must allow tenants to make reasonable adjustments to their living quarters in ways that allow them to maintain their independence. Be aware, you may be required to return it to its’ original condition when you depart. They may also require to to use a handyman they trust to do the work right, so it is important to consult with them first. Bariatric Needs: Commodes come with toilet rails included. Models that are specially designed for higher weight capacities are a good consideration because they usually provide a larger sitting surface in addition to a more stable support structure to stabilize the rails. As always, we recommend that you seek advice from your qualified health care professional about the appropriateness of a given solution or product for your needs, prior to making a final selection.